A cruise ship can be floating and cruising in the water for days and weeks carrying passengers that are out for a good time. But what makes a cruise successful for these passengers? Is it the good facilities? The good sites? The cruise pleasure and experience? 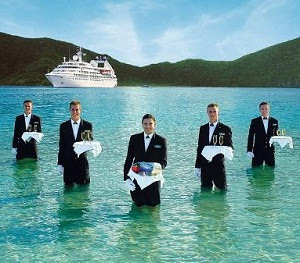 Or the people working to give the best service in a cruise ship? Almost always synonymous with “cruise staff”, these positions are considered most glamorous jobs on the ship and are the most in demand career. 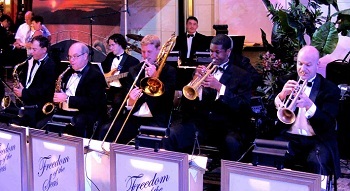 Cruise ship entertainment jobs deals with anything relating to passengers entertainment. This may include hosts and hostesses, cruise director jobs and staff, performers, disc jockeys, cruise ship musician, shore excursion staff and swimming instructors. Responsible for maintaining and running the vessel, this department doesn’t usually accept entry-level positions and mostly only experienced merchant marines that include maintenance workers, deckhands, engineers and ship officers who are in charge of passenger safety. It is their task to sail the ship, maintain the ship performance and physical state and keep it in accordance with fleet regulations and international maritime laws. Jobs on this department are concerned with managing the restaurants, bars and passenger cabins, as well as shipboard retail concessions like souvenir and gift shops. They are the ones who serves food, beverages or any kind of product that can generate them a good amount of tip from the passenger. The ship’s treasurer in charge of passenger accounts, currency exchange, ticketing and more, also called the purser, are also included in this category. Fitness, beauty, spa and medical services are included in this category. This are very important jobs in a cruise ship since most passengers signed up for a cruise to enjoy themselves, relax, be comfortable and pamper themselves and the medical department are to render services in times of medical emergencies like simple cuts and bruises, allergies and being sea sick. Office positions are generally for employees who works in the main office or branch arranging cruises, managing accounts or performing general office work onshore. Positions like administrative assistants, sales/marketing staff, clerical workers and booking agents are some of the jobs available in this category. Different cruise lines uses different categories or department for the cruise jobs that are needed in their ships but the listed jobs above are the most used categories.